July 28, 2013 - On Friday the National Transportation Safety Board released additional information on Southwest Airlines Flight 345 landing at LaGuardia Airport, New York in which the nose wheel (front landing gear) collapsed on landing last Monday. The accident occurred at 5:45 PM after the twin-engine jet's nose landing gear collapsed rearward and upward into the fuselage, damaging the electronics bay, which houses avionics and other equipment. The exterior of the airplane was also damaged from sliding 2,175 feet on its nose along Runway 4 before coming to rest, off to the right side of the runway. Southwest Flight 345 originated in Nashville. 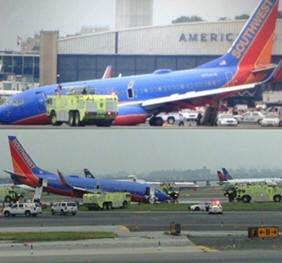 All 145 passengers and five crew members evacuated the airplane, with nine being treated for minor injuries. The airplane's slides deployed normally. Earlier this afternoon, the flight data recorder and cockpit voice recorder were recovered and sent to the NTSB laboratory in Washington for downloading and analysis. The NTSB interviewed the pilots, collected witness accounts and video. The NTSB has reported that evidence from video and other sources is consistent with the Southwest Boeing 737-700 nose gear making contact with the runway before the main landing gear. The flight data recorder on the airplane recorded 1,000 parameters and contained approximately 27 hours of recorded data, including the entire flight from Nashville to New York. The cockpit voice recorder contains a two hour recording of excellent quality that captures the entire flight from Nashville to New York and the accident landing sequence. The flaps were set from 30 to 40 degrees about 56 seconds prior to touchdown. The altitude was about 32 feet, airspeed was about 134 knots, and pitch attitude was about 2 degrees nose-up approximately 4 seconds prior touchdown. At touchdown, the airspeed was approximately 133 knots and the aircraft was pitched down approximately 3 degrees. After touchdown, the aircraft came to a stop within approximately 19 seconds. A cockpit voice recorder group has convened on Friday at NTSB laboratories in Washington to transcribe the relevant portion of the accident flight.